http://haikuoz.org/faha/haiku.html is published here by permission of its one living editor, John Bird, and by the The Australian Haiku Society. All rights reserved. This essay is republished here with the kind permission of the editors. 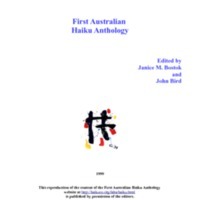 Australian Haiku Society, “First Australian Haiku Anthology,” The Haiku Foundation Digital Library, accessed April 23, 2019, http://www.thehaikufoundation.org/omeka/items/show/479.